There are three species of reptile found in Ayrshire: Adder, Slow-Worm and the Common Lizard. However, just like the amphibians, reptiles are a very poorly recorded species group in Ayrshire, and we need your help to find out how these shy and elusive creatures are faring in the local area. Reptiles are an important part of the ecosystem, forming a key link in the food web and acting as “canaries in the coalmine” for the health of the local environment. It is is important that we safeguard the environment to ensure the future of Ayrshire’s reptiles, but first we need to know where they live. 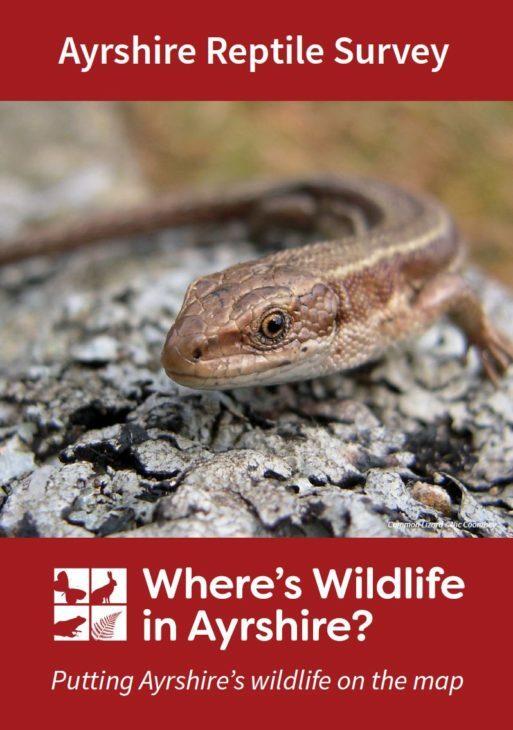 This is where you can help by submitting your records to the Where’s Wildlife in Ayrshire project. Map derived from the NBN Atlas Scotland. Map showing the distribution of the Common Lizard in Ayrshire and the surrounding region. Data is displayed at a 2km square scale, with dark red squares showing records since the year 2000, and paler squares showing those which are before the year 2000. As is shown from the map, there are very few records of Common Lizard in Ayrshire, and this is also true of all reptile species across the region. Ayrshire has many areas of suitable habitat for amphibians, it is simply the case that very little recording has been done to date across the county. These shy creatures are more than worth the wait to catch a glimpse of them. Seen any reptiles? We would love to know!